Whether your MIDAS system is "self hosted" (on your own server) or "cloud hosted" (on our servers), the software is capable of contacting our servers and also storing data within your browser. 1. When does MIDAS communicate with external servers? 1.1. During initial installation of the software. 1.3. When accessing the "Manage Addons" area of MIDAS. 1.4. Once a day to check for important notifications, messages, or license updates. 2. What data is sent to external servers? 2.2. The URL at which your MIDAS is being installed to. 2.3. 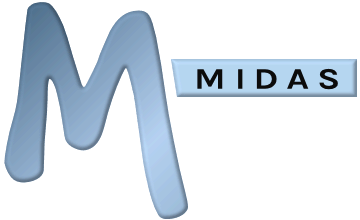 The version of the MIDAS installer you are using. 2.5. Your current MIDAS version & build date. 2.6. The URL at which your MIDAS is running. 2.7. The total number of users, venues, and databases in your MIDAS. 3. What sent data is stored on our servers? 3.1. The URL at which your MIDAS is installed. 4. Why is this data sent and/or stored? 4.1 During install, your MIDAS ID is required in order to authenticate your install, retrieve the software, and license your installation. The URL at which your MIDAS is being installed to is required in order to prevent multiple installs of MIDAS on other servers with your MIDAS ID. 4.2 When checking for software updates and/or accessing the "Manage Addons" area, your MIDAS ID, current version and build date are used to determine whether there are any software updates or addons available to you. The URL at which your MIDAS is running is used to determine the authenticity of your install. The total number of users, venues, and databases in your MIDAS is used to ensure compliance with the maximum limits defined by your MIDAS license. 4.3 When checking once a day (as outlined 1.4), your MIDAS ID, current version and build date are used to determine whether there are any important notifications for all users, indvidual users, or license updates for your MIDAS. 4.3.1 A message may be added to your login screen, visible to all users for a pre-defined period of time. 4.3.2 A message may be added to specific individual user's "My Messages" screen. 5. Where is this sent data stored? Data stored, as outlined in Section 3, is stored on our servers, based in the US. Additionally, we regularly backup data from our US servers to servers based in the UK. 6. How long is this sent data kept? Data stored, as outlined in Section 3, is stored indefinitely. 7. Can I prevent MIDAS sending this data? MIDAS requires the data outlined in Section 2 for the reasons outlined in Section 4. Blocking your MIDAS from such communication with our servers will mean you will no longer be able to receive software/addon updates and notifications. 8. What data is stored "locally" in my browser? Cookies are required and used to store a unique session ID each time you log in to MIDAS. The new "Web Storage" capabilities of HTML5 are utilized to improve your user experience of MIDAS by storing certain settings. For example, Web Storage is used to remember the number of days shown in your booking grid between visits, or the sort order of your Pending Booking Requests screen, or the last selected "tab" on the Manage MIDAS screen. 9. How long is data stored "locally" by my browser? "Session" cookies (containing a unique MIDAS session ID) will automatically expire when you close your browser, logout of MIDAS, or when your MIDAS session expires. Cookies used to remember your MIDAS credentials, theme, language, database choices will persist until Midnight on 1st January 2020, or until cleared by the user. Web Storage data will persist in your browser until overwritten or manually cleared. 10. This policy is governed by the law of England and Wales, and is subject to the exclusive jurisdiction of the courts of England and Wales.